Two brothers were raised to know that Viking blood runs in their veins. But when it comes to passion and rivalry, they're desperate to discover if God's peace can dwell in their hearts. Thor Norgaard, a Deaf man in rural Appalachia, once led a secluded life in the shadows of his charismatic brother, Haakon. Now married to the woman whose hand they both sought, Thor is honored to be the keeper of Aven's heart. With his brother and longtime rival half a world away on the Norwegian ice trade, the Norgaard farm has become a haven-until a decades-old feud with the neighboring farm wrenches the family toward the fiercest confrontation on Blackbird Mountain since the Civil War. Lives are threatened and homes are at stake-especially for Thor, who shows signs of a grave illness brought to him at the first prick of warfare. 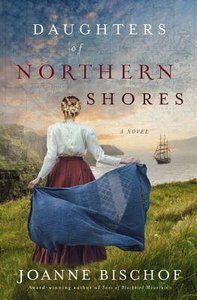 When Haakon finally allows the winds to bear him home after four years at sea, he finds the family on the brink of tragedy. Without hesitation, he rises to the challenge of protecting those he loves, but when it comes to his blood-deep rival and the woman he once loved, Haakon must draw lines not so easily marked-ones that shape a battlefield where pride must be broken enough to be restored, and where a prodigal son may finally know not only the healing peace of surrender but also the boundless gift of forgiveness. About "Daughters of Northern Shores (#02 in Blackbird Mountain Novel Series)"
Married to her first sweetheart, Joanne Bischof lives in the mountains of Southern California where she keeps busy making messes with their home-schooled children. When she's not weaving Appalachian romance, she's blogging about faith, writing, and the adventures of country living that bring her stories to life.